• Eco-Pull is a manual device and the steel rules on the cutting board can be pulled vertically. • When using Eco-Pull to replace steel rules, it assures that the gap of the board can be recycled for not being widened. • Enhances work efficiency, assures operators of safety, and avoids personnel from injury due to inappropriately usage. • Max. capacity : 3pt. • Solid aluminum-alloy construction, very light and fancy outlook. • Grabbing rules without sliding like pincers. • Pulling rules vertically and stably. • Efficient and easy operation. • Extremely safe and comfortable to operate. 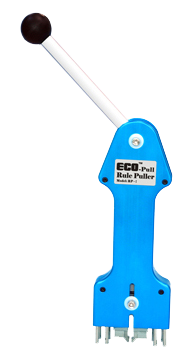 • Eco-Pull is designed for the sole purpose of pulling the steel rules required to be replaced on the cutting board. This tool is not suitable for other categories. • Eco-Pull is to be operated in a die-room and used directly on the cutting board. • Pull steel rule vertically, so the board will not be damaged. • Eight pins (foot) are movable, so it can be used in different cutting-die. • During operation, hands should be kept away from the steel rule, so it can protect the hands from injury. • The jaw is economic and durable, and it can be replaced easily. • The machine can be operated easily by both left-handed and right-handed users. • User-friendly design makes the operation more comfortable and safe. Special Lever Principle design assures both vertical pulling and personnel of safety.